Today while I was at work I received a notice on my phone that I had an Evernote reminder for today. I was excited because I knew when I got a chance to do some genealogy today that I would be following up on this reminder instead of sitting at my computer trying to figure out what I needed to work on. First I created a Pennsylvania death certificate search list from my Legacy database and saved it as a pdf. When I have some time I go through my list and look for the death certs on ancestry.com When I find the death certificate I save it to my computer and then process it. I saved Christianna Daum's death certificate as 6769 -- Christianna Elizabeth Cadwallader Daum in my Cadwallader surname file on my computer. [Christianna is my 4th great grandmother]. I then pulled [drag and drop] the death certificate into Evernote in a new note and add the appropriate tags [#1] and title [#3]. I also add the url of where I got the death certificate from [#2]. I found a new cheat sheet today for Evernote. It has been added to my Evernote Genealogy notebook. Below is a screen shot of the cheat sheet. The cheat sheet was found at Cheatography. The cheat sheets are free; you can also create your own. This particular sheet was created by ferdipeeters on 22 April 2017. The cheat sheets are licensed under a creative commons license. You can view it here. 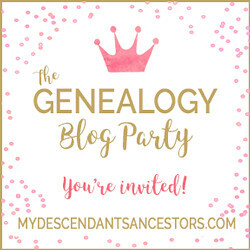 Also, you can find the pdf in my shared genealogy notebook or by going to this link to download the pdf. I am in no way affiliated with cheatography.com I just really enjoy the simplicity and ease of use of their cheat sheets. Do you wish you could see your Evernote Reminders in your Google Calendar?? You can and I will show you how! 1. Go to Cronofy -- Cronofy syncs with Evernote and Google Calendar with 2 way syncing. You can change the title in your calendar and it will also change it in Evernote. 2. Select your calendar service. (I set mine up so they show up in a separate calendar in Google Calendar called TO DO. If you want to set up a separate calendar do it before connecting your Google Calendar. If you do not know how follow these instructions). 3. Connect with your Evernote account. It may take a few minutes to see your reminders in your calendar.